Happy New Year! Today the Tuesday Throwdown team is back for another fun challenge using silver and or gold on your project. I am using this beautiful stamp set from our sponsor, MyGrafico called Valentine Birds. I used a gold shimmer paint mixed with other colors for my background. It's hard to see in the photo but the paint also has a nice pearlized shimmer allover. I kept this pretty simple and used copic markers to color the image then popped it up using foam tape. Be sure to stop by the TT blog for more DT inspirations and enter to win a fun prize from our sponsor. Yep, I do so adore those wee birds!! Thanks for watercolouring (again) with the crew from SHOPPING OUR STASH this week!! 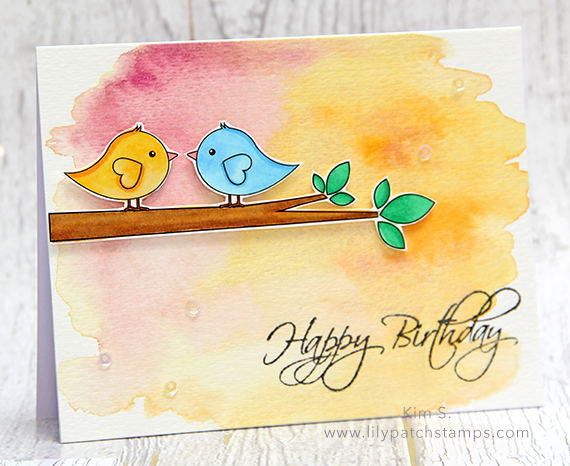 Hi Kim, this is such a cute design and beautifully water colored. You really showcased the images well, and they look great against the shimmery background. What a wonderful card! There's those sweet birds again! So cute sitting on that branch. 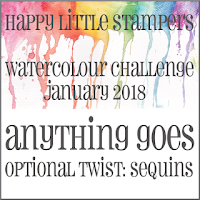 Thanks again for sharing with us at HLS Watercolour Challenge. Very cute birds! 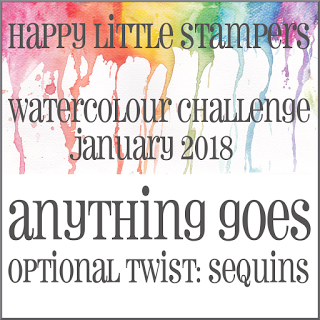 Thank you for sharing both of your cards at Happy Little Stampers Watercolour Challenge.